The new Albacete Subus app, developed by Cuatroochenta, allows users to find savings in CO2 emissions into the atmosphere every time they take the bus, as well as the total savings of all users. That is one of the main novelties of the application which has been officially presented this week by the Albacete City council and Vectalia, the concessionaire company specialized in passenger mobility with presence in Alicante, Albacete, Teruel and other French cities (it is one of the first five groups of the sector in Spain). The app, which is now available on Google Play and Apple Store, means for Cuatroochenta another step in the development of efficient solutions for public transport, after the success of the official app for EMT Valencia. 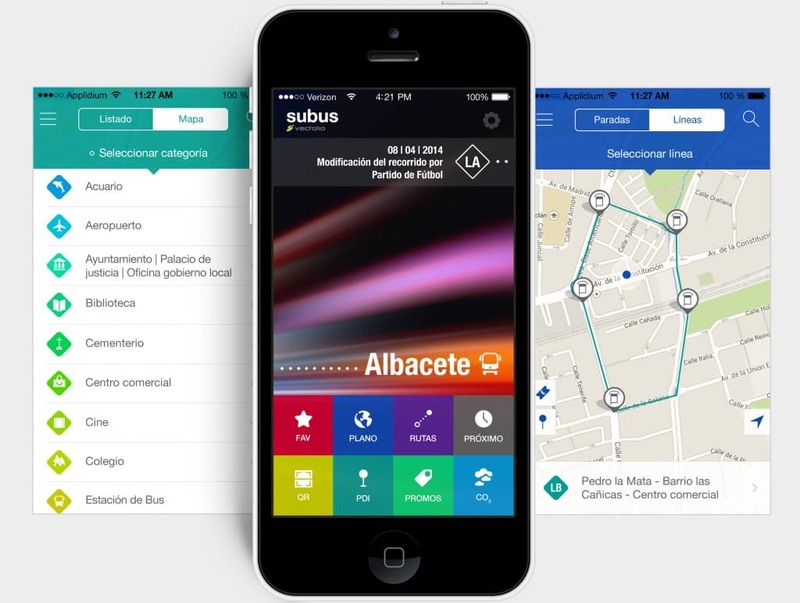 The Albacete Subus App enables residents and tourists to consult from their mobile phones all the real time information about routes, stops, waiting times, incidents or attractions in the city, so that it becomes the best assistant to plan urban routes with public transport. The City Council and the concessionaire expect the application to reach 5,000 users daily. Saving favorite stops and routes with Street View locations, a notification system about bus departures, and estimation of the waiting time for the next bus by reading the QR code at the stop, incident notification…The Albacete Subus app thus becomes an indispensable ally to make an effective use of public transport. And it does so in an easy and intuitive way: Cuatroochenta analyzed the ergonomic finger position when using the application with one or two hands. It also analyzed the different adjustments of the screen models available in the market; font sizes, colors and other related aspects so that the user experience is the most satisfactory. >”Una novedosa app facilita el uso del autobús en Albacete” (El Digital de Albacete). >”Todas las novedades del autobús urbano, a un click en el móvil” (ABC-Castilla-La Mancha). >”Una app da datos sobre el bus urbano” (Tribuna de Albacete). >”Albacete cuenta con una aplicación que ofrece información a tiempo real de todos los autobuses y paradas de la red” (La Cerca).